When you get to Paris you may want to go further.David Q May’s site has some useful routes. However, if you want to avoid all this foreign muck, or simply don’t have too much time, you can take a diversion at Lewes to end up in Brighton. Why go via Newhaven and Dieppe? This is a fairly direct route of about 73 miles (117km) from Tower Bridge in London to Newhaven (77miles, 123km if you start from St Pancras International railway station). I’ve lived in south and central London or East Sussex for most of my life so I know the area and I think that this route takes in the best rural scenery and attractions. In London it uses the signed Sustrans cycle route 21, which I think is the best way through south London. It passes through historic Greenwich and has two possible start/finish points- the dramatic Tower Bridge or the London Eurostar terminus. Apart from on route 21 it is not signed. Apart from a couple of short sections, it is all on quiet roads or lanes, or separate cycle paths. The route is designed to be suitable for any type of bike. Riders of very lightweight racing bikes should use the road alternatives over the north downs and may want to walk their bikes for very short stretches. The alternative is the longer Sustrans Avenue Verte route. Because it tries to link up a lot of off road routes it starts from Newhaven by going east to near Eastbourne. It then turns north to near Tunbridge Wells before turning west to Crawley. This is a long way round, although it is flatter than my route. The Avenue then passes through the Industrial/residential conurbation of Crawley/Gatwick Airport/Redhill which is not my idea of fun. I think the route into London, through the south west part of the city, is undistinguished. But the routes cross at Newhaven, Crawley Down and just north east of Redhill, so you can mix and match them. The very athletic could do the route between London and Newhaven in a day by using the night sailing from Newhaven or the very early sailing from Dieppe, but I think that this would be a mistake. It is only for the very fit and you would miss a lot. A two day trip would involve doiing about 35 miles (55km) a day. Many cyclists who have toured before will be able to do this. You would need to stay in the Crawley Down/East Grinstead area. If you are travelling south and getting the morning ferry I also recommend a stay in Newhaven, or the camp site nearby, to avoid the road from Lewes, which can be busy in the rush hour. But I recommend allowing 3 days or more. This may seem very generous, but gives you time for excucursions and visits. If you have not toured before remember that you will be carrying luggage that will slow you down 25miles a day is a good milage for a first trip. Going south this option also gives you time to travel to the start point. There are three points I particularly recommend that you consider stopping at: Greenwich, for local history, the country south of East Grinstead, for cycling in the Low Weald, and the medieval town of Lewes. If you are travelling south and getting the morning ferry I recommend a stay in Newhaven , or the camp site nearby, instead of Lewes, to avoid the road from Lewes, which can be busy in the rush hour. The route guide is in a number of sections. It is designed for use either starting from London or from Newhaven and can be ridden by any bike. Touring bikes, town bikes, hybrids are all fine. A mountain bike will do, but you may find it a bit slow on the tarmac bits. I researched a lot of the route on a Brompton, but this may be a bit adventurous on a few off road bits. On a very lightweight racing bike you should take the road alternatives over the north downs. Coming from Newhaven read each sheet from the bottom up. Instructions common to both directions are given in black. Directions that only apply to people heading north are given in red. Directions that only apply to people who are headed south are given in blue. Here are GPX files for the route. If you are going to be cycling around London away from the route you will need the cycle maps published by Transport for London. These cover the route north of Fickleshole and will also help you plan how to get to the route from Euston and other London stations. It is possible to take your bike on surface trains provided that you do not travel into London in the morning rush hour or out of it in the evening rush. You can take your bike on some underground lines out of rush hours. These are Circle (yellow) District (green), Hammersmith and City (pink), Metropolitan (maroon). These routes will get you to most London main line stations. You cannot take your bike on the Docklands Light Railway or the Croydon tramlink. See the Eurostar web site for details of how to take your bike between Paris and London. Notice that Eurostar has a service where they will send your bike in advance and keep it for you to pick up within up to about 14 days. This is an alternative to trying to find somewhere in London or Paris that will store your bike securely. The best source of accommodation in London is Trip Advisor UK or Trip Advisor FR but this will not tell you whether or not the place takes bikes. Between the edge of London and East Grinstead hotels get a lot fewer on the ground. I have not checked most of these out but here are some places to check. Outside the city places have more space so things are easier. Premier Inn South Croydon a ten minute ride up Coombe Road from Addington. Pendell Barn is just north west of Bletchingly, under the north downs. Copthorne Hotel North of Crawley Down, a couple of minutes off of the route. East Grinstead is a good centre for accommodation and is just off the route. Saxons is between Sharpthorne and Horsted Keynes, about 0.5km north of the route. Wild Boar Camping on the route just south of Horsted Keynes, offers pre erected bell tents with facilities. The Griffin Inn at Fletching is on the route. The Bull on the Green is at Newick, to the west of Piltdown. In Lewes and the area round it the South Downs Way accommodation guide lists a large number of places. Search on Lewes with accommodation with cycle storage. For Newhaven Tripadvisor has details of a number of places which have storage for bikes. Abbey Wood Caravan site is about four stops from Greenwich station. The site is handy for Abbey Wood Station so could be a base for visiting London. Crystal Palace Caravan site is about 3km from Kent House in southLondon. It could be a base for a visit to London but is about 15 minutes from the railway station. Heaven Farm is near Horsted Keynes 2 km from the route. Wowo is at Sheffield Park, by the Steam railway station and a kilometre south of the route. Limehouse pubs. On the main route you will pass a number of historic riverside pubs in Limehouse. They don’t look much from the outside, but have great views from inside. Isle of Dogs. Turn off to the east just south of Limehouse and see the capitalists at work. But it was not always like this. LadywellFields A fine example of a restored urban green space that has won awards. The Green London Way This 170km circular London walking route shares our route in the Ladywell area. 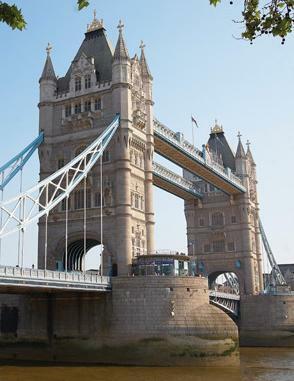 The guide to it is a passionate celebration of the history and wildlife of London. London for the connoisseur.